OW Bunker was a company founded in 1980, at the end of a decade marked by the two oils shocks that changed the oil market forever and saw the birth of modern oil trading. OW Bunker was one of the World's largest traders of bunker oil. It had operations in 29 countries and claimed to control around 7% of worldwide bunker trade. Marine or bunker fuel is a residual product of crude oil refining process and it is burned in seagoing vessels to navigate around the World. Similarly to many other commodity traders, apart from basic goods transformations (blending), OW Bunker business model was about buying in order to sell at a later stage. It bought the fuel from suppliers, mainly refiners or other traders, and later sold it to ship-owners and distributors or stored these goods for a period of time. To run the business, they used to give financing to their customers and use to receive financing from their suppliers and banks. Marine fuel trading, as many segments of oil trading in general, is a low margins business due to fierce competition among players. Higher revenues and profits can be made only by intermediating a higher volume of goods. However, low margins do not imply low risk in the oil trading business. Companies such as OW Bunker face severe market and credit risk, but at the same time well established and widely known risk mitigation techniques can effectively remove most of those risks. In this low margin and highly competitive environment, OW Bunker had at least one appeal: it was big. In a market crowded by a plethora of small and even minuscule shops, it was large and organized. Its dimension and profitability justified choosing a path normally avoided by the majority of traders. OW Bunker went public with an Initial Public Offering ("IPO") which took place in March 2014 on the NASDAQ OMX Copenhagen exchange. The IPO was what people called a success. On the 28th of March OW Bunker CEO proudly welcomed "the more than 20,000 new shareholders". The shares price went up about 20% on the first day of trading and the value of the company got close to one billion US dollars. Not bad for a company engaged exclusively in an old fashion and low margin business. During the following months no major event came to disturb the honeymoon between OW Bunker and its happy shareholders. Unfortunately, after spring and summer, the first days of fall started delivering bad news. On the 7th of October the company released a profit warning, mainly due to "unrealized accounting loss before tax of approx. USD 22 million in Q3 2014", triggered by the slide in oil prices. On the 23rd of October the company further restated the loss at USD 24.5 million and, in an Investor presentation, gave some further details about the drivers of this loss. No more details were to follow. Abruptly on the 5th of November the shares were suspended from trading on NASDAQ OMX. 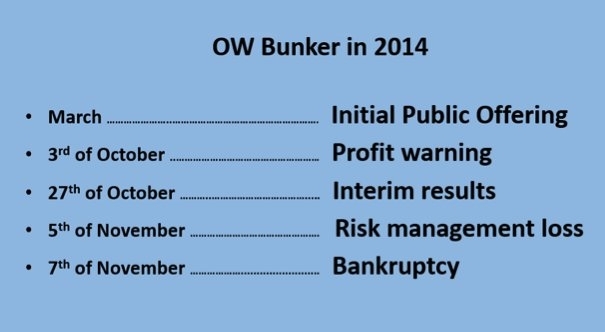 On the same day OW Bunker management declared a loss of USD 275 million. Two separate issues were behind this drama. A fraud had been discovered, put in place by senior employees in a previously unknown Singapore-based subsidiary named Dynamic Oil Trading. This fraud resulted in a USD 125 million loss. The second cause was a "risk management loss" in addition to the USD 24.5 million already communicated. Apparently the loss was found after a review of "OW Bunker's risk management exposure" and the total loss was now estimated at USD 150 million. On the 7th of November, after no other viable solution was found, the company filed for bankruptcy in Denmark. Further bankruptcy filings came in the following days in other jurisdictions. The rest of this article is centred on what OW Bunker management described as the "risk management loss". The information released by the company, in occasion of the IPO and later till the bankruptcy, allows to go in further interesting details. That is not possible for the fraud matured in the Singapore subsidiary, as it was made public just two days before bankruptcy. Unless otherwise stated, this article is based on public information realised by the Company, the same information that had been made available to its shareholders, counterparties and creditors. Sentences sourced by OW Bunker's official documents are reported in Italics. "The primary goal of our marine fuel and marine fuel component price risk management policy, which is approved by the Board of Directors, is to ensure that our business generates a stable gross profit per tonne by limiting the effects of marine fuel price fluctuations". "The overall risk limit set in our marine fuel and marine fuel component price risk management policy is defined by a maximum net open (unhedged) position for the Group. Currently, the maximum net open position approved by the Board of Directors is 200,000 tonnes. However, we operate with a lower internal risk management guideline with a maximum net open position of 100,000 tonnes, which is set by the Company's Chief Executive Officer (the ''CEO'') and applied in our operations". "The Executive Vice President for our physical distribution operations is responsible for marine fuel price risk management and reports directly to the CEO." The first point essentially tells that financial derivatives are used in order to hedge Company results against the volatility in the prices of goods the Company buys and sells. An important goal that in recent years could be easily achieved by trading exclusively plain vanilla derivatives, considering oil markets showed risibly low volatility. With the second point the Company communicates the internal self-imposed rules in place to limit the risk it faces due to oil market prices. In the IPO prospectus it is further clarified that OW Bunker's "net open position from marine fuel transactions and derivative instruments can be either long or short and is at any time below our policy limits". In summary, this information is meant to communicate the market risk appetite of the Company. However, the benefit of this piece of information is limited. How a potential shareholder, or most of the stakeholders in general, could assess the dimension and the severity of market risk the Company will be facing? How big is the risk of being long or short 100,000 metric tonnes of anything? What is the probability of a negative event generated by this volumetric exposure? Income statements, balance sheets and financial ratios are expressed in US dollars, i.e. money, not quantities. There exist well-established risk evaluation techniques that answer to these questions. The IPO prospectus could have expressed the market risk in terms of Value-at-Risk ("VaR"), a statistically based measure of the maximum possible monetary loss. VaR is widely used by commodity trading firms' risk management. In fact, many public companies frequently report their VaR figures, often comparing it with their shareholders' equity. Among other benefits, VaR takes in to account physical and financial exposure simultaneously. VaR also allows to communicate market risk current levels and limits without the need to disclose sensitive information about company business. Unfortunately nowhere, in the OW Bunker's IPO prospectus or in other documents, is VaR mentioned. That raises some reasonable doubts about the real sophistication of OW Bunker's market risk management valuation process and related IT systems. To make things clear, however, it is not 100,000 or 200,000 metric tons an exposure sufficient to cause the large financial loss that materialized just months later. The third point above opens questions about how risk management governance in OW Bunker, a public company, was shaped. In the Annual report 2013 there was no mention to an employee specifically responsible for risk management. It was reported, as being part of the management team, the existence of an employee which job title was "Executive Vice President – Physical Distribution". In the IPO prospectus this employee becomes also "responsible for marine fuel price risk management". Had this employee sufficient experience in market risk management? Was a sole employee in charge of trading operations and risk management? Was this a self-controlling employee, without anyone else balancing this power? We will come back to some other specific points of the IPO prospectus while analysing the other documents that were realised some months later. Alessandro has nearly 20 years of experience in the energy industry, matured in companies active in the production and trading of oil, natural gas and power. He specialized in energy risk management and pioneered modern risk measurement techniques with the application of Value-at-Risk (VaR). Alessandro has built and managed successful middle office functions, shaping business processes that have been consistently delivering key risk indicators to crucial company stakeholders. He has also been in charge for pre and post trade management of financial derivatives and the application of international regulations and exchanges rules. He has taken part to a number of successful projects related to the implementation of Commodity/Energy Trading & Risk Management software (C/ETRM). Alessandro frequently delivers training for executive education and in-house programs and has wrote a number of articles published in books and reviews. He is currently an independent advisor and a member of the Energy Oversight Committee for the Global Association of Risk Professional (GARP). For 9 billion yen ($81m) . But the focus is on quality, not simply volumes. Acid number can be a reflection of naturally occurring naphthenic acids or a reflection of contamination with acidic compounds. But the Chamber will support any review of wash discharge standards if necessary, says Policy Director Anna Ziou. Delegates gathered at the 7th Bunkernet Bunker Conference told markets could also be impacted by factors outside of the marine fuel sector. 2019 starts the year with lowest sales since 2015. But there are currently no plans to mandate the use of MFMs.